I find it hard to believe that the damage would impact the driving performance of that car. I would truly like to find this car at auction and buy it. It will be a great driver for years to come. If you look closely that is a DB9 being lifted at the suggested front locations and by the inner floor pan support at the rear location. Yes, some dealers do this as I have asked a few. I am not going to divulge which dealerships as I do not want a lynch mob heading in their directions. Just ask your local dealership the next time you visit them. I made a set of piloting blocks and lift my car by the suggested locations. I am pretty sure that, if everybody on this forum look under their cars, a lot will find lifting "scars" like these. State Farm determined the claim to be a total loss, which included a handful of reasons but mainly based on the current value of the vehicle versus the cost of the necessary repairs and the time necessary to perform these repairs. 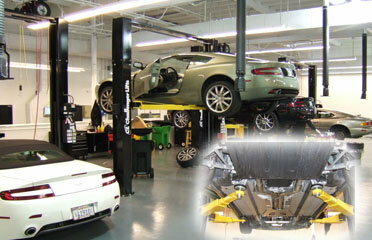 Keep these cars away from unqualified techs! Reiterate to them that there are specific jacking points if not going to an AM dealership. This was certainly a learning experience for me. After such an event, I've come to an opinion that it may be best to service higher end vehicles at their respective dealerships only. Not worth the risk! Wow, I hope your check from insurance will allow you to replace your AM. Would you mind telling us how the car drove after the damage? Did it feel any different to you? I would not be able to tell anyone how this vehicle drove really. I only drove it about 40 miles in bumper to bumper traffic from the time I had the tires put on to the time I dropped it off at the body shop the following Monday. Car has been getting towed between the mechanics at Beverly Hills AM and Harry's Auto Collision Center since. Regarding the value of the car, State Farm booked it just under $55k. I paid way north of that when I bought it of course. So yes, I do end up taking a financial loss on this car. Could I purchase someone else's used V8V for $55k? Possibly...but when looking for a CPO grade Aston Martin (mine was re-certified back in November 2015 and I added another 24 months of factory warranty), it becomes a bit more challenging. Factor in vehicle's history, desired color, options, inspections...should have bought the tires from the dealership; end of story. What year was your Aston, if you don't mind. Also, check with the dealer. Warranty extensions are usually refundable at a prorated portion. Let us know what tires you had just put on there, someone may be in the market. Thank you for the answer as to how it drives, I get it now. I'm not trying to stir the pot here, but State Farm should compensate you for the extended warranty. Or in the long run, the insurance company for Firestone. I wish you the best. This was a valuable but painful lesson. I wish you find another AM that meets your needs. Take the Shelby out, do a couple of burnouts and destroy the rear tires. Thank you to everyone who shared their appreciation for this thread and your respective thoughts / advices. Besides the obvious lessens learned here, I think it is noteworthy to bring up how important it is to have our Aston Martins, or any high end vehicles for that matter, to be insured by a reputable carrier. I have read some insurance threads that seems to detail high premiums for these cars (if they will insure them at all). You get what you pay for in the end. In my particular case, State Farm's team was there for me, and they definitely minimized my stress burdens. FYI, there was another Aston Martin Vantage V8 at this same body shop that was rear ended and this car was also deemed a total loss. The rear end damages were near $38k and the vehicle was I believe either a 2008 or 2009. Further validation why insurance premiums can be high for these cars. why is your insurance paying for it? shouldn't firestone be responsible? are your rates going to be affected? My rates are not going to be impacted. State Farm is subrogating the claim back to Firestone. I could have directed this claim to Firestone solely but I preferred to have the protection of my own insurance carrier representing me.